Chandeliers that others look up to. H-Profil the design flexibility to flatter both contemporary and traditional interiors. Our bespoke service means you can form it and shape it to your project. Spectral's bespoke luminaires are based around the H-Profil aluminium extrusion. Available in standard in Silver, White and Black, and any other RAL colour and finish on request. The aluminium chassis provides the basic framework around which the light sources and optics are mounted. Uniquely, Spectral are able to form the aluminium body into smooth curves with a minimum radius of just 600mm. 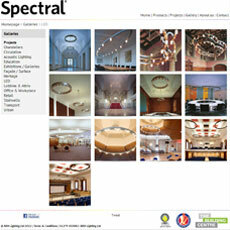 Spectral's range of light sources and optics are designed to be efficient and functional as well as good looking. Based around the latest LED technology and the best of traditional light sources, each is available in a wide range of power outputs and colour temperatures. Profiled cyclinder in heat and UV resistant PMMA sits	flush in the H-Profil extrusion. High powered spotlight for general illumination. 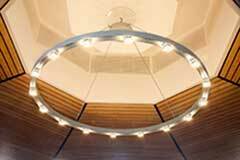 Available with a range of beam angles and reflector finishes? Crystal clear acrylic optic with matt light emitting surface. The light source is completely obscured by total internal reflection within the optic. Decor element designed precisely to the dimensions of the profile. Individual colour adjustment for an added touch of elegance. The perfect way to add a unique accent as a recurring element in otherwise minimal room architecture. High efficiency LED with DALI RGB colour control. H-shaped basic track element made of extruded sectional aluminium. Upper and lower U section for fixture of luminaire units and spots to customer order. The upper section features a groove on both sides for the freely locating fixture of steel wire pendants. Length version and combination of inserts in accordance with customer specification and detailed planning. Production in accordance with release drawing. Profile surface powder coated in silver. Grey and black as additional standard colours, available as a modification in any other RAL shade. Available as both a straight and a curved track element. Includes end caps, pendant and ceiling junction box.